“Adrienne Vogt and Harper Penny were closer than sisters, until the day a tragedy blew their seemingly idyllic world apart. Afraid that they got away with murder and unable to accept who they had lost—and what they had done—Harper and Adri exiled themselves from small-town Blackhawk, Iowa, and from each other. Adri ran thousands of miles away to Africa while Harper ventured down a more destructive path closer to home. Nicole Baart has created a powerful story of two women running from their past and, in some ways, running from what’s right in front of them. The Beautiful Daughters revolves around Adrienne Vogt and Harper Penny who became close while attending college. Then a tragic accident after graduation tears them apart not just from each other, but also from their families. It’s the same accident that brings them back together to face their demons and reveal their secrets. Based on what Adrienne went through and what Harper was going through the book’s theme is based on abusive relationships. I think Baart did an excellent job with the theme of the book and didn’t make it too much for the reader. It could have easily become too hard to read. I personally can’t relate to abuse, but I feel that Baart really portrayed what might be going through a woman’s head when rationalizing their actions or the actions of others in those types of relationships. There isn’t a lot of romance in the book, but that’s because both women are trying to patch themselves up. It’s really about them accepting who they are, making themselves better, and then moving forward in their lives. 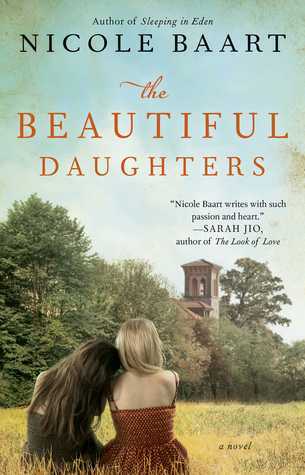 The Beautiful Daughters is a compelling novel about love, loss, and fear. I would recommend this book to my followers who like to read women’s fiction and can read books with a more sensitive subject matter. I won an advanced copy of this book through Goodreads courtesy of Atria Books. A critically acclaimed novelist, Nicole’s work has been featured as a Midwest Connections book pick, nominated for a Christy Award, and earned a starred and featured review from Publishers Weekly. In 2011 she co-authored a book that debuted at #4 on the New York Times bestseller list. Nicole is also the co-founder of a non-profit organization, One Body One Hope, that partners with a sisterhood of churches and orphanages in Monrovia, Liberia. An adoption advocate and the mother of four children from four different countries, Nicole speaks on a variety of topics ranging from orphan care to parenthood to books and the writing process. When Nicole’s not writing, working for One Body One Hope, or carpooling her children from school to hockey to gymnastics to cello lessons, you can usually find her outside. A lover of the great outdoors and a child at heart, Nicole’s favorite pastimes include playing with her kids, gardening, camping, and practicing her many hobbies including running, photography, baking, and re-teaching herself how to play the piano. Nicole lives with her family in a small town in Iowa, but holds dual American/Canadian citizenship and considers British Columbia her second home. Since Liberia is also home, Nicole likes to think of herself as a global citizen. She and her family love to travel and hope to see the world together–before her kids are too old to consider their parents cool.